The Youth Alpha-size System (S, M, L - small, medium, large) is used world wide. Together with the US size system (age) and the EUR size system (height), it is the most used youth clothing size system internationally. Youth alpha size is used from approx. 7/8 years age and up to around 15/16. Then the men's size system is next. 1. Height: Body height measured when standing upright against a wall. 2. 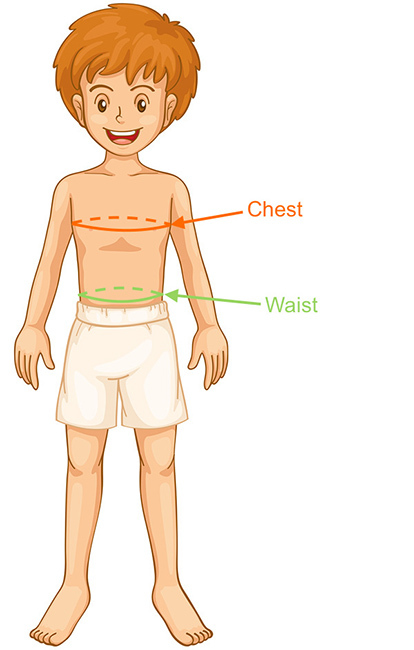 Waist Measurement: Circumference around boy's waistline (just above the navel/belly button). 3. Chest: Measure circumference aroundt fullest part of chest (under arms). Boys' General Youth Size by body measurements. All measurements in inches. Smaller sizes? See our Children's Size Chart. Larger sizes? See our Men's Size Chart. Boys' General Youth Size by body measurements. All measurements in CM.